With playgrounds and a kids’ club, Schluga Seecamping offers families a full-service camping experience with the amenities of a resort. Its proximity to breathtaking natural wonders and thrilling recreation opportunities also makes this luxury camping site a fantastic choice for nature lovers. For a family-friendly camping holiday, book at stay at Schluga Seecamping with LuxCamp. Established in 1954, this family-run campground offers spacious mobile home accommodation. Surrounded by mountains and overlooking a picturesque lake, this beautiful luxury camping destination covers 8.8 hectares. Within 300 metres are tennis courts and an amusement park, and picturesque hiking trails are also nearby. From beautiful lakes to dramatic mountain ranges, the campground's idyllic location means there is plenty to explore and experience. Every comfort is provided at this holiday camping site. 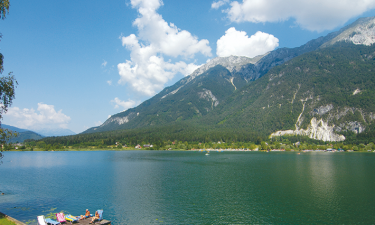 You can unwind and admire the inspiring mountain scenery from one of the site’s terraces overlooking Pressegger Lake and the Carnic Alps, including at the campground’s Waldschenke restaurant. Amenities include baby changing facilities, dog showers, and large washing blocks with showers. You will also find a TV lounge and football pitch. 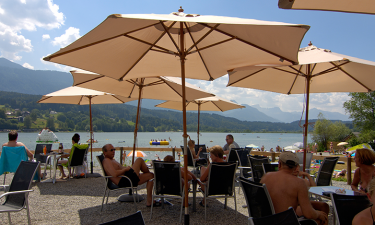 This luxury camping site is only 200 metres from a beach on Lake Pressegger, a fantastic spot for water sports including canoeing and windsurfing. There is also a playground on the beach where you can also enjoy volleyball, table tennis and badminton. A heated outdoor pool is the ideal spot to cool down and enjoy the water at the campground. Along with a spacious pool for all ages, there is a wading pool for toddlers to splash and play.